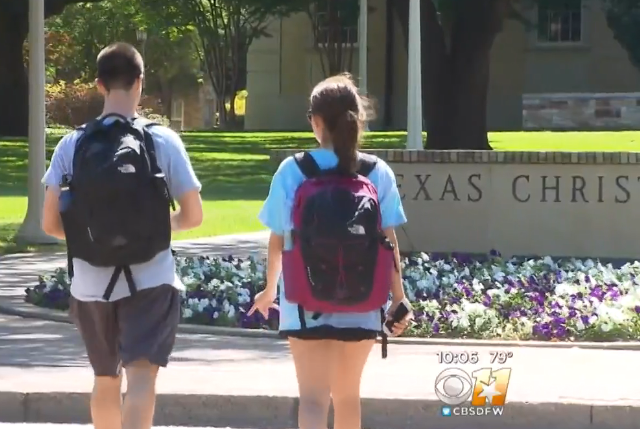 FORT WORTH, Texas -- Tutors employed by Texas Christian University are being accused of providing forbidden material to students who are now suspended in a cheating scandal. The allegation comes from the attorney hired by the students to get them back in class. TCU would neither confirm or deny the claims, CBS DFW reports. The university said a dozen students were suspended during finals exams. It didn't say how long the alleged cheating went on or for what classes. A popular app called Quizlet is at the center of the cheating investigation. Senior Taylor Wirtz, who is not involved in the investigation at all, said almost everyone used the app. "Basically it's a website where you can make flash cards and online quizzes just to help practice for tests, so if you have notes or something you want to type up, you can put them on there." The suspended students, who have the right to appeal the suspension, hired a Fort Worth lawyer, Letty Martinez. She said the students "located and studied previously posted materials readily available on Quizlet -- not knowing these items would be on the exam. Some students were even directed to these materials by TCU employed tutors." Wirtz said it's completely possible the students may not have known what they were seeing on Quizlet. "You don't really know what you're looking at when you're looking on there, so it might just be someone's notes and someone might be like, 'Oh I heard this was on a test,'" said Wirtz. Martinez said, "The 'cheating' accusations stem from the professor's belief that students should notify professors if they recognize exam questions." She is calling for TCU to review its policies regarding apps such a Quizlet and to reverse the suspensions. "We represent a number of TCU students who were recently suspended from the University on allegations of 'academic misconduct' after using Quizlet — a public online study guide used by millions of students worldwide. While preparing for an exam, the students located and studied previously posted materials readily available on Quizlet — not knowing these items would be on the exam. Some students were even directed to these materials by TCU employed tutors. As it turned out, the professor responsible for the exam recycled test questions from past semesters. The 'cheating' accusations stem from the professor's belief that students should notify professors if they recognize exam questions. The knee-jerk suspensions have far-reaching and lasting implications for the students involved. The sanctions are being vigorously appealed. In this modern day, it is incumbent for Universities to adapt to changes in technology and for professors to change their tests. It is our sincerest hope that after TCU officials review the cases in full, cooler heads will prevail and the sanctions will be reversed."